I was amazed at the sunsets everywhere in Arizona. Maybe it was because it never rained, but the colors were amazing. Just when I thought they couldn’t be better, the subsequent night would be even more extraordinary. And so it went from one night to the next night, glorious sunset after sunset. In the mountains and even from city streets. Some nights, the sunset was so red it turned the mountains red, too. 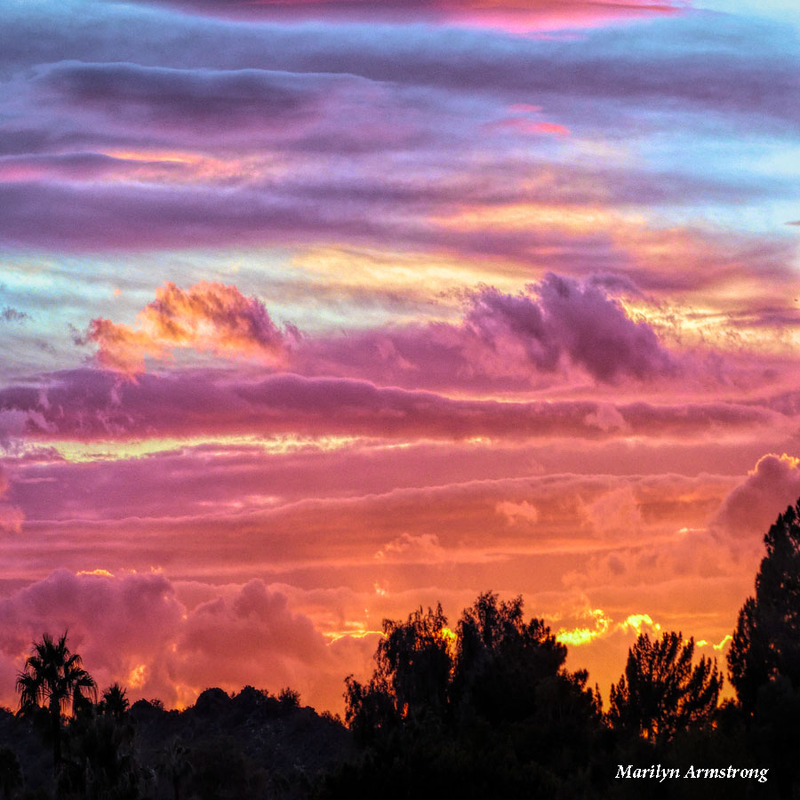 These are extraordinary skies Marilyn. So beautiful. I would have been stood there a while! Every night, we just stood there and watched. After a while, I stopped taking pictures, but I never stopped looking. They were amazing and they changed color as the sun dropped lower. Amazing Marilyn, if you painted those colours nobody would believe it. One night, in Phoenix, the sky was so red, the mountains turned red. I took pictures, but they looked fake. Because mountains don’t turn red in the sunset. That’s a Hollywood thing. It would be quite the sight.. It was a nightly event. Maybe because of all the deserts in the area, the atmosphere is full of particulates? I know sandstorms will cause fiery sunsets… something has to be refracting the sun’s rays to cause that. I don’t think I’d ever get used to it. Sunsets in the west are often gorgeous. Utah, New Mexico and Arizona have the most spectacular. Most people love sunsets on the water. I do too. But there is something special with the inland regions and mountains that provide unusual sunsets. Yours are breathtaking. It must be the dust in the air that reflects the colors. We get some beautiful sunsets here, but they were like that EVERY night. It was like some majestic, giant painting by the gods. Possibly the dust. In central California the pollution can trigger unnatural sunsets. Gorgeously freaky. It was like that EVERY night. The locals weren’t impressed, but we sure were! 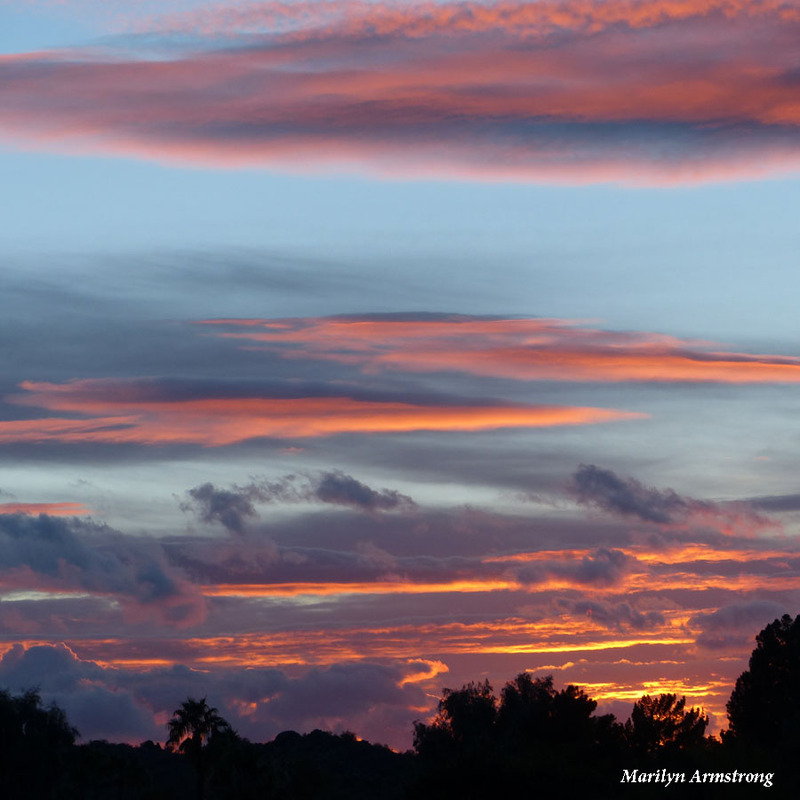 With that “big sky” you see over the southwest, the sunsets are even more remarkable. And the colors were so bright and they reflected on everything — including the nearby mountains.